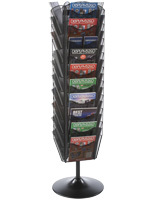 The metal magazine rack is able to highlight up to 20 publications on each of this display's 4 sides. 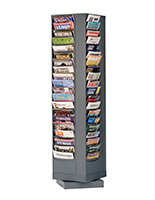 The spinning steel stand will easily hold periodicals, flyers, and papers, like cardstock. 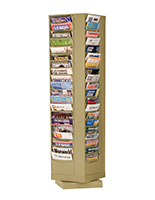 The rotating literature holder, metal magazine rack is great for displaying materials in many settings, like a doctor's office or library. 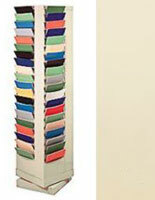 Retail stores could also use this to showcase cardstock, vellum, and other specialty paper. 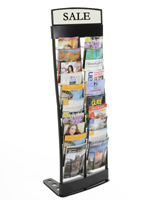 The metal magazine rack, called a steel literature display, is durable and sturdy to last for quite a while. 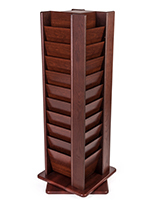 The black finish on this holder will help it to blend into the background and make whatever is in sure to get noticed by customers or clients.